Whether your hair is long or shoulder length, chances are, you pull it back into a ponytail at least some part of almost every day. Unfortunately, the ponytail ridge and damage caused by regular hair elastics remain long after you let your hair back down again. These ponytail holders feature a patented sliding system that gently tightens the elastic without twisting, making it gentle on the hair. Available in a variety of colors and charm styles, this clever little problem solver is turning heads not only for its ease of use, but also for its unique styling. When not in your hair, Pulleez can be worn around your wrist like a bracelet. Pulleez creator, Diana Wright, came up with the idea while working as a fashion producer. She needed a backstage solution that would slide out quickly and easily leaving models’ hair runway ready in no time. Before long, Pulleez made their way front and center onto the catwalk. From the fashion world to the office, gym, and even the playground, Pulleez bring new found health and beauty to the everyday ponytail. Pulleez are a simple solution to a common problem, born out of necessity during the craziness of backstage fashion shows. 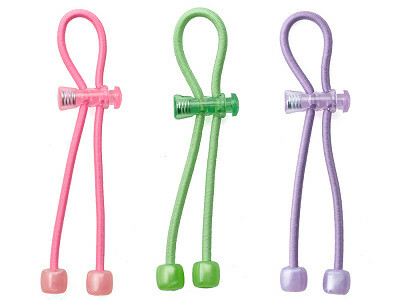 These ponytail holders use a pulley system that eliminates the dreaded hair-crease caused by tightly wrapped elastics. Even better, the dangling charms add extra flair to any hairstyle, and unlike most hair ties this is one ponytail holder you'll actually want to wear on your wrist. We hope you love Pulleez as much as we do! Hi Grommet fans! I am a celebrity stylist that works regularly with Pulleez. Please feel free to ask me any questions you may have about the product. Have a happy hair day! @Angela The challenge in this house- 3 of us have super fine, straight, slippery hair. It's challenging to find elastics that will stay in place. How heavy are these? @Sarah Yes, I'm currious how they work on various hair types as well. @Jennifer @sarah thanks for asking! Pulleez will hold ANY type of hair; you simply squeeze the toggle to your desired tightness and it will hold all day. The lightest style is the 'nugget', I literally work out in one almost every morning and can barely feel it in my hair. The knots are a little heavier, but still very comfortable. @Brandon a wooden Pulleez is a great idea! We have a skull Pulleez that are popular with men that we will try to make available on the Grommet soon. @Angela please be sure that children do not wear these in a higher ponytail during active sports. 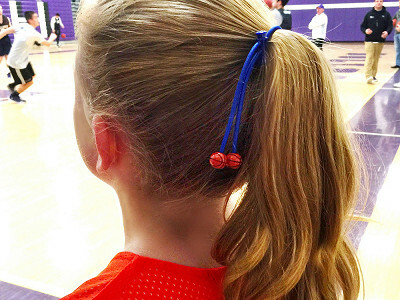 Hard materials in hair accessories have caused Traumatic Brain Injury in children who have fallen on them during sports. Just a safety tip -- this product is really innovative! I like the concept and wear my hair in a pony often. My only comment is the price. I would want the metals and I wouldn't pay $16 for one. Maybe for several, but not for one. @Kelly thanks for your feedback about the price. Please note that Pulleez feature custom charms on the end that are made of brass and coated in gold and silver tone. They are like jewelry for the hair and double as a chic bracelet when not being used as a ponytail holder! Scan just above. They have an option that's popular with men and we'll let our community know if we make it available on The Grommet. I received the email about your 3 color plastic product less than an hour ago from Grommet. I proceeded to order but half way through check out it said out of stock. Really disappointed. Before buying the metal product I wanted to try out the plastic cheaper model. These are for children and I wanted to be sure they could handle them. New product but already out of stock! Good for Grommet, good for you, too bad for me. I do note that the item is being restocked and have requested notification when available. I would love to try this product BUT $16 is much too expensive for one metal hair tie. I would also prefer the metal parts to be available in silver as I don't wear gold. @Krista thanks for your feedback; please note that Pulleez are like jewelry for the hair and the charms are custom-made out of a lead-free brass material that is then coated in gold or silver. Noted about the silver, we carry them and can make them available on The Grommet soon. @Krista I forgot to mention that Pulleez double as a chic bracelet… you will get more compliments when you wear Pulleez on your wrist than any other bracelet you wear! I agree that I would want the metal in silver as well, as I don't wear any gold and I also agree that $16 seems high price for one hair tie. If you click into the box that says "buy", you'll see images that show both our silver and gold options. We are offering both. Not to beat a dead horse but $16 is extremely spendy; what type of warranty, or guarantee is there on the product? If it stretches out, breaks, etc, is there a money back guarantee within a period of time? What timeframe would that be? If it does not perform to expectations (leaves a crease in my hair) is there a money back guarantee within a reasonable amount of time? @Betty @Nadine Pulleez feature custom charms, making them like jewelry for the hair. They also double as a bracelet when not in the hair! There is no guarantee you won't ever get a crease; if your hair is wet and you pull it very tight it could leave a crease behind. We have never had a complaint about the elastic stretching and there is no product guarantee however all of our customers are extremely happy! Umm. .. I'm not sure what's so innovative about this. I did this *years* ago with a spare elastic tightener from a parka. You can buy several of them for about a dollar from a craft store. I bought one a year or so ago and I love it! I have very fine hair and wasn't sure it would work on me but it totally does. It holds my hair beautifully even during a spin class. I've had it for at least a year and wear it a few times a week and it has never stretched out. I do wear it as a bracelet when I think I may want to put my hair up and have gotten comments on how cute it is. I've seen these at Henri Bendel in NYC for much much more and think $16 is a great price given how much I use it. Thrilled to see pulleez on the Grommet… my daughter took mine when she went back to school last summer & I never saw it again! I originally saw it on The Today Show & knew it was something I had to have because my hair is always in a ponytail. Once you wear a pulleez you will never wear an ugly elastic band again. Going to order as soon as they are in stock. This looks great! I have a question, though: what about people with intense activities? In my case, I do a lot of ballroom dancing, including hustle and salsa with all their spins. I have thick long hair that normally makes my hair elastic fall out mid-song. How well would Pulleez hold up? @Guest thanks for your question it's one that we get often. We recommend the acrylic Pulleez for intense activities. The acrylic styles are extremely lightweight, and will hold even the longest hair through any activity. They can also get wet and sweaty, simply rinse afterwards & lay it out to dry! I took a look at the metal choices - any chance that you will offer the silver knot with champaign elastic - that would look very nice with blonde hair. @Barbara thanks for your question; we currently do not make the silver knot with champagne elastic but we will consider doing so! We do however make a Sandstone Pulleez which is a silver nugget with a champagne elastic … we will try to make available on the Grommet soon! Do these really NOT put a permanent crease in the hair that is pulled back by the Pkulleez? No one has made a comment about this. Thank you. If you scan just above, Angela actually answered this question. She says "There is no guarantee you won't ever get a crease; if your hair is wet and you pull it very tight it could leave a crease behind. We have never had a complaint about the elastic stretching and there is no product guarantee however all of our customers are extremely happy!" We've had many testers here in the office and they all report that it works just like it says. I love the silver beads but notice only gold ones are for sale. Do you have plans to offer the silver ones shown in the video? @Debbi the silver beads were the most popular today & sold out very quickly! We are in the process of restocking them and they will be available on The Grommet in about a week. Our sincerest apologies for the inconvenience. 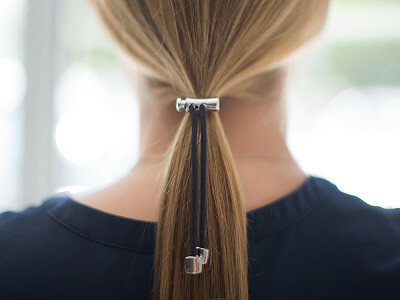 With VERY thick and heavy hair...would the metal ponytail holder work?